This is a great unit for a small foot print in a house, that still brings the HEAT! this unit is capable of producing 55,000 BTUs and heating up to 1,500 sqft. it has a more modern feel to it and is very customizable. 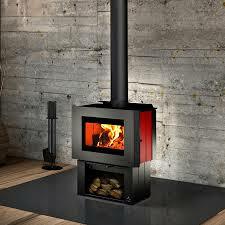 These stoves can come with a regulr pedesal or a two sided one. different color schemes also add personality to this stove (red, black, creme). A blower can really help distribute the heat at 130 CFM.